By Allan Fox: Max Kellerman of ESPN expects Floyd Mayweather Jr. to do whatever he pleases this Saturday night in his event fight against Conor McGregor in Las Vegas, Nevada. Kellerman is predicting that Mayweather (49-0, 26 KOs) will be looking to carry the UFC star McGregor for at least 3 rounds before he knocks him out. Mayweather won’t try and knockout McGregor, 29, right away due to him wanting to give the boxing and MMA fans an entertaining fight, says Kellerman. 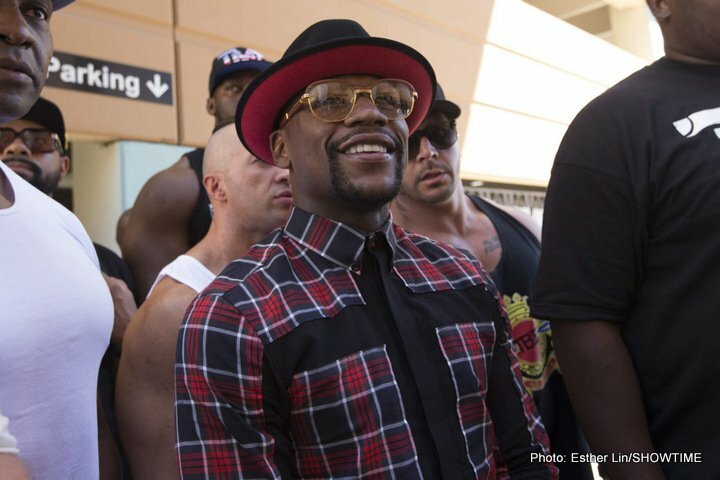 Despite what Mayweather says this will be his last fight, he could have ideas in the back of his mind about returning for another big $100 million payday fight against another UFC fighter or perhaps even McGregor. For Mayweather to rope in the fans, he can’t destroy McGregor too quickly. Mayweather needs to leave him out there long enough for the boxing and MMA fans to be entertained so they’ll open their wallets for his next PPV fight. The only thing that could spoil Mayweather’s plans to carry the UFC fighter for 3 rounds is if McGregor chooses to start slugging right away in a furious way. If McGregor does that, Kellerman thinks Mayweather will have no other choice but to flip the switch on his offense and take the over-matched UFC fighter right away for a quick knockout. This means we could see McGregor knocked out in the 1st or 2nd round. That would anger a lot of fans if the fight ends that early. The fans are paying a lot of money to see this fight live at the T-Mobile Arena in Las Vegas and on Showtime PPV. The fans will not be pleased if Mayweather destroys McGregor right away because it’ll make them look like saps for spending so much money to see the mismatch in the first place. “Floyd can do whatever he wants in this fight,” said Kellerman on ESPN’s First Take. “It’s even really about being aggressive. It’s about putting on a show. Floyd doesn’t want to end this fight early and everyone goes home disappointed that it’s a total mismatch. He wants to put on a show. I expect him to carry Conor McGregor several rounds before stopping him. But if Conor comes in super aggressive and forces him to take him out a little earlier than what Mayweather will like, then that’s what will happen,” said Kellerman. It’s a given that the fans are going to be upset. The only way the fans won’t be upset is if McGregor knocks Mayweather down 2 or 3 times, and we see an upset. The fans would be happy to see Mayweather get off the deck several times and come back and score a knockout. It would be like watching George Foreman vs. Ron Lyle. That was an incredibly exciting fight where both guys went down, and got up and continued brawling. McGregor might just force Mayweather’s hand early by attacking him aggressively in the 1st round, and put him in a situation where he’ll need to KO him right away just to survive. Mayweather says he wants to make it an exciting fight so he can pay back all the boxing fans that were bored by his fight against Manny Pacquiao in 2015. That means Mayweather cannot afford to get on his bike and move around the ring like he did at times against Pacquiao and Marcos Maidana. 1 billion people are supposed to view the Mayweather-McGregor fight on Saturday night. It wouldn’t look good for the 40-year-old Mayweather to run from McGregor, especially given that this is his first fight as a pro. McGregor was given a boxing license recently by the Nevada State Athletic Commission, and they sanctioned his fight with Mayweather. The Commission has received a lot of criticism for sanctioning the fight. Fights involving novices and former world champions don’t usually happen in the United States because the sanctioning bodies look out for the fighters to protect them. In this case, the Nevada Commission chose to bless the Mayweather-McGregor fight despite it appearing to be a terrible mismatch. If McGregor gets hurt on Saturday, there will be a great deal of finger pointing at the Commission for sanctioning the fight. ”Floyd is aggressive when he chooses,” said Kellerman. ”I think he’s going to do that at times against Conor, but the big picture is not that. He’s going to want to put on a show. He’s going to want people to leave happy in case there’s another $100 million payday out there for him that he wants people to buy in the not too distant future,” said Kellerman. The chances of this working out well for Mayweather are very, very small on Saturday. He’s either going to knockout McGregor too fast for the fight to be entertaining or he’ll take too long and bore the fans. Mayweather has a high balancing act with this fight. He has to make it entertaining and he can’t destroy his over-matched opponent too quickly. Most of boxing and MMA fans know that McGregor has no chance in the fight. They still want to see the fight for that chance that McGregor must pull off an upset. The odds really stacked against McGregor in this fight. If Mayweather does have plans in the back of his mind to return to boxing for another fight against an MMA fighter, then he’s going to need to do a respectable job of carrying McGregor. That means Mayweather will need to fight hard enough for the fight not to be boring like his last fight against Andre Berto in September 2015. It was so obvious that Mayweather was carrying Berto that it made the fight excruciatingly boring to watch. Mayweather stayed in 1st gear for the entire 12 rounds against Berto, who he had hand-selected over more deserving fighters like Keith Thurman. Mayweather justified his choice of Berto by pointing out that he’d just gone through a hard fight against Manny Pacquiao in May of 2015. What Mayweather forgot was the Pacquiao fight was not a hard one for him. It was an easy one because of Pacquiao’s injured right shoulder that he came into the fight. Pacquiao had an injury and he was fighting poorly. Mayweather didn’t have to take a lot of punishment. If Mayweather fights McGregor like he did Berto, he’s going to turn a lot of boxing fans. It looks like the fans seem to have short memories, because many of them will be purchasing his fight against McGregor on Saturday. If the Mayweather-McGregor fight does turn out to be a bore, Mayweather can always wait 1 to 2 years for the boxing and MMA fans to simmer down and forget about the fight before he faces McGregor in a rematch or he fights some other MMA guy. That’s all that Mayweather is interested in fighting now, MMA guys. He’s not going to fight any boxers, because none of them are popular or harmless enough for him to fight. Mayweather could make a lot of money fighting the winner of the Saul Canelo Alvarez vs. Gennady Golovkin fight, but that would be very dangerous for him. Canelo is no longer 22, and Golovkin punches hard enough to KO Mayweather even if he doesn’t land cleanly. Mayweather would have to earn his money in a fight against either of those guys, and the fans would really get their money’s worth in a fight of that type. Mayweather isn’t interested in those types of fights. He’s interested in facing MMA guys with no boxing experience so he can get easy paydays.